This item is one of only 100 signed black vinyl records printed. By far the fewest official signed records of any of the releases (including red and silver versions which each have 3-4 times that amount signed). You will receive a copy of the original receipt. Record will be signed by Dave Mustaine and David Ellefson. Will be an amazing piece of official Megadeth memorabilia. And this item won't last long. Century Media & Legacy Recordings are proud to announce the 2018 deluxe re-issue of Megadeths classic debut album, Killing Is My Businessand Business Is Good! Killing Is My Businessand Business Is Good The Final Kill has been completely restored to Dave Mustaines intended vision. Remixed by veteran metal mixer, Mark Lewis (Whitechapel) and remastered by Ted Jensen for an optimal listening experience, the 2018 version reveals unheard parts and performances throughout the record. This rare gem includes the full album, along with 7 live audio tracks from VHS tapes found in Dave Mustaines own attic! In addition to the bonus live tracks, the 2018 re-issue also features Megadeths 1984 3-track demo and the once removed cover of Lee Hazelwoods, The Boots that has been added back to the record with recut vocals intended to maintain the integrity of both the original song and Megadeths own snarling rendition. The package is further enhanced by a new album cover featuring a fully executed sculpture of the iconic skull that has been lost over the many years since the albums initial release. The packaging also includes classic flyers and band photos pulled from their archive of timeless metal moments from Megadeths storied 35 year history. The Final Kill is the complete vision of main man, Dave Mustaine, who has contributed liner notes delving into the struggles during that time period as well as some of the surprising moments during the remixing sessions. Last Rites / Loved to Deth (04:44) 2. Killing Is My BusinessAnd Business Is Good! The Skull Beneath the Skin (03:48) 4. Rattlehead (03:43) Side B 1. Chosen Ones (02:53) 2. Looking Down the Cross (05:03) 3. These Boots (03:42) Side C 1. Last Rites / Loved to Deth (live) (1987 London, UK) (04:48) 2. (live) (1986 Denver, CO) (04:08) 3. The Skull Beneath the Skin (live) (1990 London, UK) (03:36) 4. Rattlehead (live) (1987 Bochum, Germany) (04:05) 5. Chosen Ones (live) (1986 Denver, CO) (03:49) Side D 1. Looking Down the Cross (live) (1986 Denver, CO) (04:40) 2. Mechanix (live) (1986 Denver, CO) (03:47) 3. Last Rites / Loved to Deth (demo) (04:15) 4. The Skull Beneath the Skin (demo) (03:12) 5. Mechanix (demo) (Remastered) (04:00). 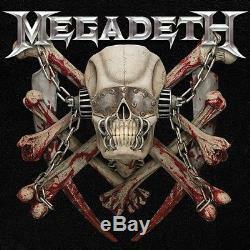 The item "Megadeth /100 SIGNED VINYL Preorder Killing Is My Business Mustaine 2LP BLACK" is in sale since Sunday, April 08, 2018. This item is in the category "Entertainment Memorabilia\Autographs-Original\Music\Rock & Pop\Records". The seller is "mccawgomets" and is located in Bangor, Maine. This item can be shipped to United States, Canada, United Kingdom, Denmark, Romania, Slovakia, Bulgaria, Czech republic, Finland, Hungary, Latvia, Lithuania, Malta, Estonia, Australia, Greece, Portugal, Cyprus, Slovenia, Japan, China, Sweden, South Korea, Indonesia, Taiwan, South africa, Thailand, Belgium, France, Hong Kong, Ireland, Netherlands, Poland, Spain, Italy, Germany, Austria, Israel, Mexico, New Zealand, Philippines, Singapore, Switzerland, Norway, Saudi arabia, Ukraine, United arab emirates, Qatar, Kuwait, Bahrain, Croatia, Malaysia, Brazil, Chile, Colombia, Costa rica, Panama, Trinidad and tobago, Guatemala, Honduras, Jamaica.